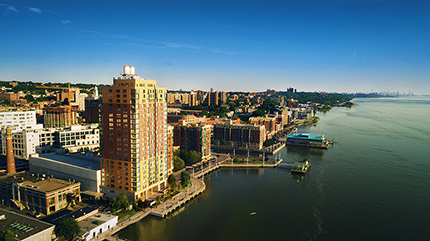 Yonkers, NY River Club at Hudson Park, a new rental tower located in the city’s waterfront neighborhood, has officially launched leasing, according to developer Strategic Capital, the investment arm of China Construction America. Situated along the Hudson River at 63 Wells Ave., the 24-story building will introduce a new standard to northern NYC and Westchester County with its apartments and suite of amenities. At 240 ft. tall, views will be a hallmark of the tower and provide panoramas of the Hudson River, New Jersey Palisades and NYC skyline. River Club at Hudson Park signifies the fourth and final building in Strategic Capital’s 16-acre waterfront development Hudson Park. The development is stretched along a half mile of the Hudson River Promenade and is comprised of three other rental buildings in addition to River Club. Hudson Park, with River Club at the forefront, is helping to spearhead the revitalization of the downtown area, transforming it into a living destination of choice for many New Yorkers on the hunt for homes at a better value in close proximity to NYC. Located steps from the rail station, it is a 28-minute train ride to Midtown Manhattan. River Club at Hudson Park has been designed by architectural design firm JSA, which opted to infuse a sophisticated and contemporary design aesthetic into the building’s 214 residences ranging from studios to two-bedroom apartments. Each home feature white oak floors running throughout and floor-to-ceiling windows allowing for an abundance of natural light as well as views of the Hudson River and NYC skyline. Kitchens have been stylishly designed with dark walnut cabinetry, granite countertops and a subway-tile backsplash, and feature top-of-the-line Energy Star Whirlpool appliances and Kohler fixtures. River Club at Hudson Park has been designed by architectural design firm JSA, which opted to infuse a sophisticated and contemporary design aesthetic into the building’s 214 residences ranging from studios to two-bedroom apartments. Each light-filled home features the finest of finishes, with white oak floors running throughout and floor-to-ceiling windows allowing for an abundance of natural light as well as breathtaking views of the Hudson River and New York City skyline. Kitchens have been stylishly designed with dark walnut cabinetry, granite countertops and a subway-tile backsplash, and feature top-of-the-line Energy Star Whirlpool appliances and Kohler fixtures. One of its most defining features, River Club at Hudson Park will offer residents an extensive selection of best-in-class amenities. Perfect for fitness aficionados, River Club will offer a fitness center with touch-screen equipment, as well as an elegant indoor swimming pool with lounge seating overlooking the Hudson River. 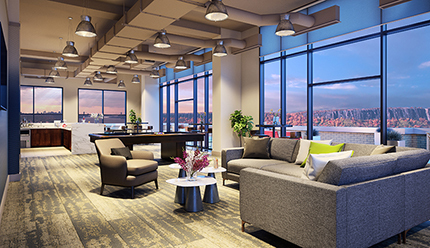 Those looking to socialize will enjoy the roof-level River Club Bar, where residents can lounge comfortably while taking in expansive views of the Manhattan skyline and New Jersey Palisades. A reclaimed wood-and-quartz bar adds a stylish detail while floor-to-ceiling glass windows frame the space. During the winter months, the ground floor River Club Lounge offers a great respite from the cold with a large fireplace with walnut mantle. Overlooking the Hudson River, the space features soaring 18-foot ceilings, walnut-clad columns and gleaming porcelain tile floors. River Club at Hudson Park will also be outfitted with the latest in home technology, including an automated package concierge locker system for deliveries, a Butterfly MX smartphone video intercom and real-time transportation information provided by Transit Screen. It is also pet-friendly and will offer smoke-free living, as well as include a 24-hour concierge service to assist with residents’ needs and requests. In addition to these resident-only amenities, River Club is also just steps from a highly anticipated boutique café the developer is also building, located nearby at 1 Alexander Street. The soon-to-open-space is being designed by the founder of Jersey City’s popular Grind Café. Yonkers has quickly become one of the most desirable living areas outside of New York City. It has cultivated its own cultural and artistic communities, as well as welcomed a slew of exciting new restaurants, galleries and retailers on par with what is being experienced throughout northern Westchester. In recent years a real estate development boom has swept through Yonkers, introducing new luxury developments and further increasing the city’s appeal.